Queen Elizabeth I, also known as Good Queen Bess, was the queen of England and Ireland for a period of over forty-five years. After the death of her half-brother, Edward VI, and the disposal of his first cousin, Lady Jane Grey, the throne was held by Elizabeth's half-sister, Mary I, briefly cooperating until Elizabeth was accused of treason and Mary soon died. Elizabeth then succeeded to the throne and reigned despite many setbacks, including a war with Spain and assassination and abdication plots, and died in 1603. In Mario's Time Machine, Mario travels back in time to return her royal Crown after it is stolen by Bowser. According to the bio for Queen Elizabeth I in Mario's Time Machine, she ruled with "strength and wisdom" and is known as one of the country's greatest monarchs. During her reign, England faced both religious divide and a war against Spain's King Phillip II (which was eventually won by the English, albeit not easily). Elizabeth's life was also threatened by many individuals, notably one of her cousins, Mary, Queen of Scots. Sometime after Mary abdicated her throne, she fled to England, where Queen Elizabeth had her imprisoned for sixteen years, having been accused of treason, until she was executed. Also during her reign, the queen frequently promoted and supported the arts, helping create notable figures like playwright William Shakespeare and explorer Francis Drake. Because of this, the era in which she reigned is commonly called the "Golden Age" of England. 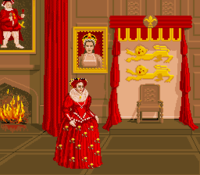 Queen Elizabeth I in the SNES release of Mario's Time Machine. 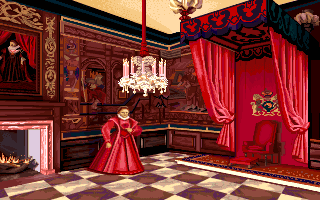 During the events of Mario's Time Machine, Queen Elizabeth I was residing at a palace in London, where she took audiences with people. At some point, her crown is stolen by a time-traveling Bowser, and a time-traveling Mario attempts to return it to her. If Mario attempts to talk to her immediately on arrival, he tells her that he must speak to her, but she him that he should not speak to the queen of England like that and threatens to execute him by chopping off his head before shooing him away. Eventually, after talking to the other individuals in the palace, including Francis Drake, Mario is able to return to Elizabeth and directly give her the crown, telling her that she needs it. She gratefully accepts it and thanks Mario for keeping it safe. Mario says that it was not much trouble at all, and the queen decides to knight Mario for defending the crown, now calling him "Sir Mario". This page was last edited on March 21, 2019, at 23:15.